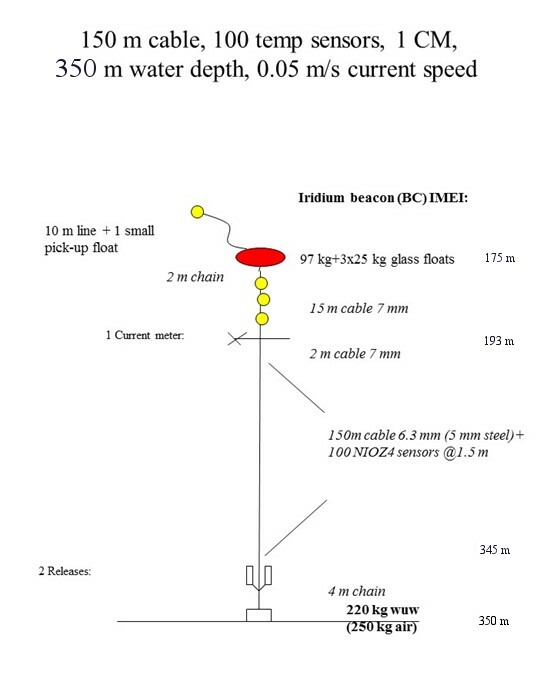 Eulerian moorings ideally fix instruments in space under water and have the flow go past it. However, as the general aspect ratio of large-scale ocean currents is 1:1000, or perhaps 1:100, the flow and the associated drag force by any object obstructing the flow are nearly perpendicular to the direction of gravity. A balance of forces is thus impossible and the mooring will be deflected by any non-zero flow. The aim of mooring design is to minimize this ‘mooring motion’, as it differs from the pure Eulerian concept of measuring flow at a position fixed in space. We impose the criterion of a maximally tight, minimally moving mooring so that the vertical deflection may never exceed half the distance between any of the instruments along the mooring line. This requires a balance between (net) buoyancy, bottom weight, cable thickness and cable strength. 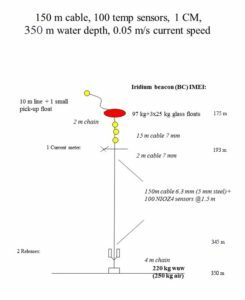 The design is verified for given (maximum) current speed using the ‘mooring dynamics’ software developed by Richard Dewey of University of Victoria, Canada. The deployment of a 1D mooring of temperature sensors, a thermistor string ‘T-string’, is similar to most commonly done for ‘standard’ oceanographic moorings. Through the ship’s aft A-frame the top-buoy is put first in the water whilst the ship is slowly steaming forward. The T-string is coupled between buoy/other instrument(s) and other instrument(s)/acoustic releases before attaching the weight that is dropped in free fall. The T-string is put overboard through a wide, relatively large diameter (0.4 m) pulley, about 2 m above deck, or, preferably, via a smooth rounded gunwhale (photo). 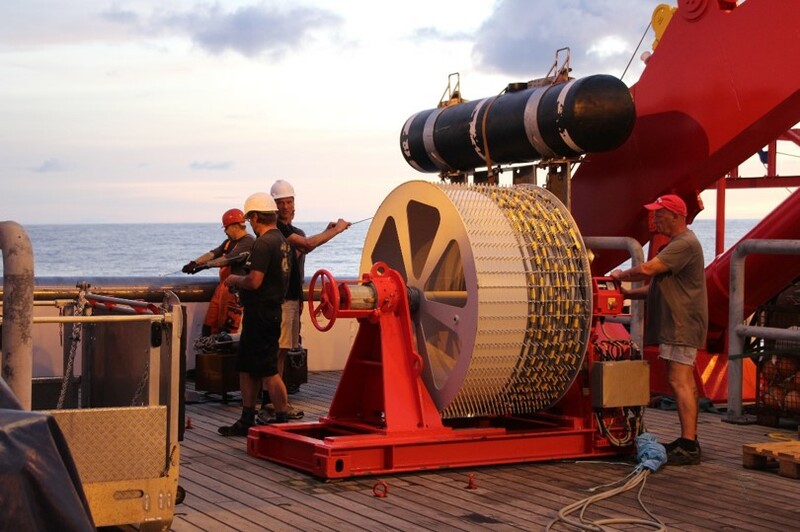 Up to 100 m length of T-string holding typically 100 sensors can be put overboard manually by one or two people. 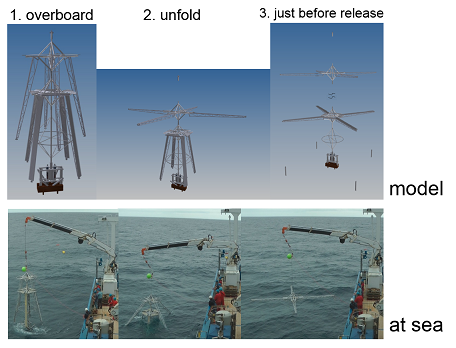 In that case, the string is laid on deck in neat long loops and the entire mooring is interconnected prior to deployment. The deployment of a longer length T-string becomes more difficult, because of the weight and drag. For such strings a 1.48 m inner diameter (1.60 m OD) 1400 pinnacles drum is constructed to safely and fully controllable deploy them. The drum’s dimensions fit in a sea container for easy transportation. The 0.04 m high metal pinnacles guide the cables and separate them from the temperature sensors in ‘lanes’, while allowing the cables to switch between lanes. The pinnacles are screwed and welded in rows 0.023 and 0.027 m apart, the latter sufficiently wide to hold the sensors (with cable). Up to 18 sensors can be located in one lane, before the next lane is filled. The drum has 14 double lanes and can hold about 240 sensors and 450 m of cable in one layer. 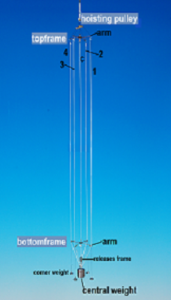 The longest string deployed successfully thus far held 300 sensors and was 600 m long, with about one-quarter of the string doubled on the drum. The doubling did not pose a problem, the sensors were thus well separated that entanglement did not occur. For recovery, or deployment of strings holding up to 150 sensors, a smooth surface drum is used of the same dimensions but without pinnacles.